During WWII the U.S. was fighting for freedom while denying its black citizens their rights and freedom. 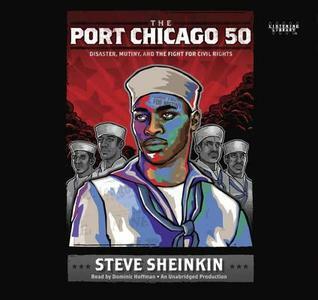 In “The Port Chicago 50: Disaster, Mutiny, and the Fight for Civil Rights” (Roaring Brook 2014) Steve Sheinkin paints a picture of the segregated armed forces. Rather than being assigned to battle, blacks worked in the mess hall. Or worse. At Great Lakes Naval Training there was one line in the mess hall for whites who ate upstairs, and another line for blacks who ate downstairs. The sports teams, music bands, blood banks and blood suppliers were all segregated. When the black sailors arrived at Port Chicago near San Francisco, their job was to load ammunition—torpedo warheads and incendiary bombs—from freight cars to ships headed to the Pacific front. They received no training in how to handle the explosives. The professional civilian stevedores were horrified. Five hundred pound shells and 650 pound incendiary bombs rolled down inclined rails from freight cars to loading nets, which were in turn raised by cranes and lowered into ship holds. The men stacked bombs one atop the other. The working conditions were chaotic and loud with clanking of metal against metal and cursing of men. Joe Small, a natural leader among the black men, took over running the winch and the duties of the petty officer, communicating with his superior (white) officers, but he was not promoted to petty officer. He did not receive the pay hike or the private room afforded the petty officer. The inevitable huge explosion, seen and felt for miles around, blew to smithereens the 10 million pounds of explosives, boxcar, ship and all 320 men—202 of whom were black—on the waterfront. There were no surviving witnesses. Another 390, mostly black men, who fought the resulting fires, were wounded. The accident was blamed on the black sailors. The official (white) navy report stated, “the colored personnel are neither temperamentally nor intellectually capable of handling high explosives.” No black sailor was asked to testify. When the survivors—those not on duty at the time of the explosion—were ordered to a new site to load ammunition, they refused. 258 black men were imprisoned on a barge. Men, crowded together, long abused by segregation laws, grew angrier. Joe Small urged them to obey rules, act as a unit, and not get violent. Small asked his superiors for improved working conditions and to desegregate the base. Instead they were court martialed. Many chose to go back to loading ammo. The group, whittled down to fifty men, were defended by a good brash young (white) lawyer, but it wasn’t enough to tip the decision of the presiding navy judge. They lost. In steps, Thurgood Marshall, working for the NAACP, appealed the case, calling their trial a frame-up. Marshall won their appeal and after serving months of hard labor, the men were released. The Navy desegregated in 1946. President Truman ended segregation in the military in 1948. This is great readable history.